April 5, 1960 - Shortly before the season opened, the Sox ended their decimation of the young players on their roster, by shipping future All-Star and power hitting catcher Earl Battey along with future power hitting All-Star first baseman Don Mincher to the Senators for power hitting first baseman Roy Sievers. Sievers gave the Sox some good years, averaging 27 home runs, 92 RBI’s and a .295 batting average in two seasons. He had a 21 game hitting streak in 1960 and made the All Star team in 1961. But Battey, who cried when he was told he was traded, may have won the Sox the pennant in 1964, 1967 or both just by himself (to say nothing of other players shipped out that off season like Johnny Romano, Norm Cash and Johnny Callison.) Battey would go on to make four All Star appearances and win three Gold Gloves at catcher. Mincher would become a two time All Star. April 5, 1974 - The Sox opened the season at home under freezing conditions versus the Angels and Nolan Ryan. The Sox started Wilbur Wood which caused broadcaster Harry Caray to comment that the game was “the tortoise against the hare.” This time the hare won as Ryan and the Angels got an easy 8-2 victory. April 5, 1977 - Literally a few hours before the team was to head north to open the season, owner Bill Veeck traded shortstop Bucky Dent to the Yankees. Salary was the reasoning behind it and Veeck’s comment that “I’d trade Dent even up for any other starting shortstop in the American League” didn’t help matters. In return the Sox got outfielder Oscar Gamble, pitcher Bob Polinsky, minor league pitcher LaMarr Hoyt and $200,000 dollars. Gamble would be a big part of the 1977 hit parade while Hoyt would have some good seasons with the Sox culminating with the 1983 Cy Young Award when he won 24 games. April 5, 2004 - New Manager Ozzie Guillen figured he had his debut game all wrapped up as the Sox took a 7-3 lead into the ninth inning at Kansas City. 20 minutes later the Royals scored six runs to take the game 9-7. The amazing rally set the modern record for the most runs scored in the ninth inning to win a game on opening day. 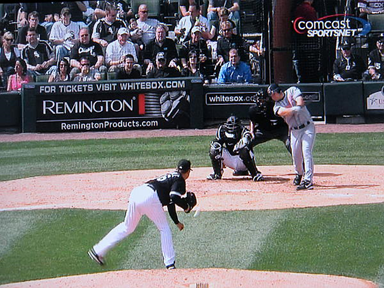 April 5, 2010 – It was opening day and for Mark Buehrle, it was his eighth opening day start setting the franchise record and breaking the tie he had with Billy Pierce. Buehrle was brilliant in the 6-0 win over the Indians but what everyone was talking about after the game was the play he made on a hard hit ball off the bat of Lou Marson in the fifth inning. Both ESPN and the MLB Network called it the play of the year. Marson’s shot ricocheted off Buehrle’s leg and was hit so hard it was headed towards foul ground on the first base side of the field. Buehrle sprinted off the mound, fielded the ball with his glove and flipped it between his legs to Paul Konerko who made a barehanded catch nipping Marson by a step. It was simply an incredible play.